The Tuesday between our birthdays, Bob and I got together for another picnic, our first of the season. Instead of wandering around our more familiar haunts in Lincoln Park, I went out to his neighborhood in Rogers Park. 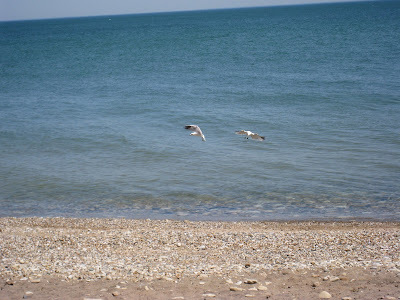 We walked through a string of small parks along the lake, finally settling on a more secluded little beach not too far from Evanston. It's really beautiful around there, and it was an absolutely gorgeous day. Ok, I thought it was a little hot in the sun, but Bob just laughed at me. It was pretty fantastic. I gave quite a bit of thought about what to prepare for our picnic. Seeing that it was a birthday picnic, I did want to make it a little special, even on my more limited means. The only thing I was certain of was that I had been wanting to make some whole wheat french bread for a while. That seemed like a good vehicle for something picnic-y so I pulled out the ingredients the day before and made a couple of loaves. But what to put in them? I was thinking some kind of pressed sandwich. I had a recipe for citrus-marinated olives that I had been wanting to try. I figured that would make a good base for the sandwiches. I added chunks of tuna canned with olive oil to round it out. I made the sandwiches in the morning, wrapped them tightly, and let them sit under my cast-iron skillet for an hour or so before leaving the house. I hadn't made French bread in a while, and I had only made it once before, so the loaves were less than perfect. 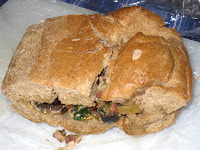 The taste was ok, but the bread was a little thicker and more chewy than I had anticipated. But I will keep working on it until I get exactly the taste for which I am looking. The marinated olives and tuna were a complete success. The zest from the orange and lemon brightened the salt of the olives, and the red chili flakes gave it a lovely boost. The olives complemented the tuna perfectly. I'm thinking next time I mix a little of the citrus marinade with the tuna the night before I make the sandwiches, to boost the flavor even more. A chilled soup seemed like it would be a good accompaniment to the spicy sandwiches. There was a recipe for Farmers' Market Chilled Salsa Soup I had pulled from Vegetarian Times a while ago that I decided to try. I followed the instructions and blended up the soup, then froze some of it into ice cube trays to help keep it cool until we were ready to eat it. Unfortunately, I also put it into thermoses, so not only did the ice cubes not melt, they helped to freeze the rest of the soup so we had to wait for it to melt before we could eat it, and it never really melted enough. There was so much olive oil in it that it had coagulated, leaving a most unpleasant texture. Once it had thawed enough for us to try it, we were both a little disappointed. The flavor was ok, mainly cucumber and green pepper. The salsa I brought to garnish the soup was a canned soupy salsa, so while it did contribute to the flavor, it did nothing for the texture. Bob said he thought it might be better if there were actual chunks of cucumber and green pepper in it. What you see in the picture on the left is from my experimenting with leftovers the next day. I added chopped cucumber, bell pepper, and tomato. It was an improvement, but not enough of of one to make me inclined to make it again. I had leftover cucumbers and bell peppers and some tomatoes on hand, so when this soup was gone I whipped up a batch of gazpacho. The gazpacho won hands down, so whenever I feel the need to puree me some vegetables I'll take that option, thank you very much. I'm afraid I am going to have to give up on this magazine. They have quite a few recipes that have looked good over the years, but more times than not I have been disappointed with the outcome. 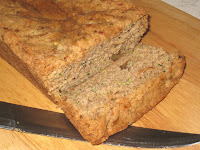 For dessert, I brought half a loaf of zucchini bread I had made that weekend. My sister and I had been talking about it and zucchini was on sale at Treasure Island, so it seemed like the natural choice. I got this recipe years ago, just out of high school, from my friend Sharon. I don't know where she got it. It used to seem like a lot of work to make, but now I'm not sure why. There is a lot of zucchini grating required, but that takes just a little bit of work and even less time. It never seems like it's going to amount to much, but it's moist, rich, and delicious. Like gingerbread, it gets more moist over time, and the spices deepen and intensify the flavor. I will definitely make this more often, especially when zucchini are in season. All in all, it was a delightful meal, perfect for a picnic. As you can see, Bob seemed to enjoy it. 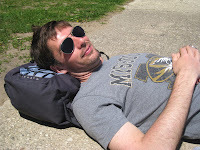 We hung around the park for a little while longer before heading across the street back to the city and the hustle and bustle of our everyday lives. 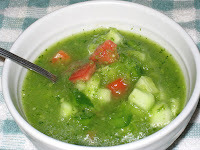 You can find the recipe for the soup (if you want it) by clicking on the link up by the photo. I will follow up on the zucchini bread in another post. If you want to try the citrus marinated olives, I highly recommend it. The recipe calls for whole olives, but I chopped them so they would make a better condiment for the sandwiches. Combine all ingredients in large heavy-duty resealable plastic bag. Shake bag to blend ingredients. Refrigerate at least 1 day and up to 3 days, turning bag occasionally. Transfer olives and some marinade to bowl. Let stand 1 hour at room temperature before serving.